Also joining the team are three IBRRC interns, José María “Chema” Barredo, Laura Barcelo and Yeray Seminario fresh from their experiences on the San Francisco Bay oil spill. All interns are fluent in Spanish. Currently there are 430 oiled birds in care, including 20 steamer ducks, 200 Magellanic penguins, 180 silvery and crested grebes, 41 cormorants. The steamer ducks and Magellanic penguins are the highest conservation priority as they’re both listed as near threatened by Birdlife International. 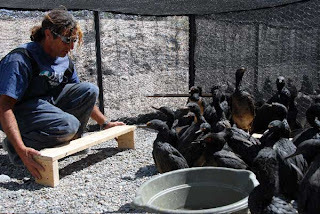 Fundación Patagonia Natural (FPN) staff member Carla Poleschi is the Wildlife Branch Director for the Argentine Government’s Incident Management Team. 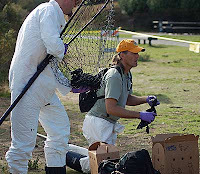 Carla has worked with IFAW on other spill responses in Argentina and has asked for the International Fund for Animal Welfare’s Emergency Response Team to help manage the wildlife response. Spill clean-up is underway and being handled by the Navy but the Government has yet to determine the source spill. The oil spill has covered an area of 24 square kilometres in the Atlantic Ocean. Recent satellite imagery is being analyzed to try and determine the cause of the spill. An oil spill of unknown origin was detected on December 26, 2007 along the coast of Chubut Province, in Argentina. The spill site is located 12 km north of Comodoro Rivadavia, in Caleta Cordova, approximately 1,740 km south of Buenos Aires. The Argentine Government is supporting the development of a wildlife response facility, as well as providing supplies and equipment needed to care for animals. In addition to the the International Fund for Animal Welfare’s IFAW ER Team, there are approximately 100 volunteers under their direction, assisting with the rescue effort. IBRRC works in partnership with IFAW worldwide to response to major spills and develop trainings to help local groups learn how to best treat oiled animals. IFAW is again sponsoring IBRRC staff and other wildlife professionals Mexico and elsewhere to travel to this remote region.